After earning rave reviews with her rock-and-roll memoir But Enough About Me, Jancee Dunn takes on fiction in this comically poignant debut, a perfect read for anyone who has ever looked back nostalgically and wondered what might have been. At thirty-eight, Lillian Curtis is content with her life. She enjoys her routine as a producer for a talk show in New York City starring showbiz veteran Vi (“short for vibrant”) Barbour, a spirited senior. Lillian’s relationship with her husband is pleasant if no longer exciting. Most nights she is more than happy to come home to her apartment and crawl into her pajamas. Then she’s hit with a piece of shocking news: Her husband wants a divorce. Blindsided, Lillian takes a leave of absence and moves back to her parents’ home in suburban New Jersey. Nestled in her childhood bedroom, where Duran Duran and Squeeze posters still cover the walls, she finds high school memories a healing salve to her troubles. 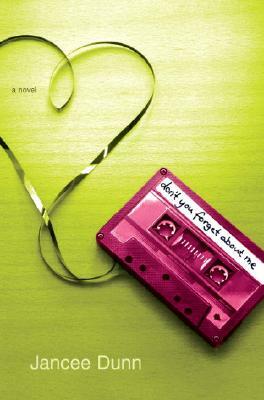 She hurtles backward into her teen years, driving too fast, digging up mix tapes, and tentatively reconciling with Dawn, a childhood friend she once betrayed. Punctuating her stroll down memory lane is an invitation to the Bethel Memorial High School class of 1988 twenty-year reunion. It just might be Lillian’s chance to reconnect with her long-lost boyfriend, Christian Somers, who is expected to attend. Will it be just like heaven? Lillian discovers, as we all must, the pitfalls of glorifying the glory days, the mortification of failing as a thirtysomething adult, and the impossibility of fully recapturing the past. Don’t You Forget About Me is for anyone who looks back and wonders: What if? "In addition to being an impressive treasure trove of cultural references both high and (frequently) low, Jancee Dunn is also a tender novelist. Don't You Forget About Me is wistful, graceful, and seriously funny."